Found a new bio of Perry Thomas Knight in the Georgia Official and Statistical Register, 1955-1956 – page 134 (below), and new photo at Berrien County Historical Photos Collection. Prior to attending Southern Normal University, P.T. Knight attended the Green Bay School near Ray City, and the Oaklawn Academy at Milltown, GA (now Lakeland, GA). In 1923, he led the fundraising effort to pay for the Doughboy Monument in Nashville, GA.
PERRY THOMAS KNIGHT, Atlanta, Dec’d. Associate Public Service Commissioner Emeritus. Born Mar. 7. 1877 at Rays Mill, Berrien co., Ga. Graduated Southern Normal University, LL.B. degree, 1901. 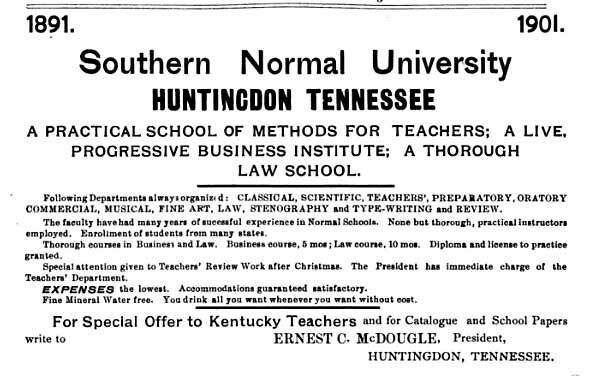 Advertisement for Southern Normal University, 1901. Began the practice of law in 1901. Baptist. Democrat. Mason. WW I —Chaplain & 1st Lt. Former member, Berrien County Board of Education; W. & A. Railroad Commission, 1925-27. Member, house of rep., Berrien co., 1921-22, 1923-23 Ex.-24. Senator, 6th dist., 1925-26. Ex.-26 2nd Ex. Public Service Commissioner, Jan. 25, 1928 – July 21. 1933 removed by Governor Eugene Talmadge; re-elected Nov. 16, 1936–continuously served until Apr. 1, 1953 (vice-chairman 1949 until date of retirement, April 1 1953). Retired under Legislative Act, and became Associate Public Service Commissioner for life. Dec’d Sept. 17 1955. Family details: Married July 19, 1903 in Milltown (know Lakeland) Ga., Annie Lota Duggar, daughter of Wiley J. and Sallie (Bowen) Duggar. Children: James Perry, married and has 5 children; Elwin Thomas, married and has 4 children. Perry T. Knight was the son of George Washington Knight and Rhoda (Futch) Knight, and the grandson of Aaron and Nancy (Sloan) Knight, and of John M. and Phoebe (Mathis) Futch. According to 1917 draft records in Berrien County, P. T. Knight also engaged in farming operations and was an employer. One of his workers was Charles Anthony Ray, a one-eyed farm laborer from Wayne County.